Spa and beach are two of the many kinds of unpleasant experiences while on vacation in Bali. Bali has a very beautiful beach. The beach is the main capital of Bali to lure tourists, while the spa is complementary to the tourists who want tranquility and relaxation. Vacation in Bali, it is worth starting by visiting the beach in South Bali. In Bali there are many options south beach for fun, or just to relax while enjoying the fresh and beautiful atmosphere. While at the beach, usually tourists sun bathing while enjoying the beach with ocean waves. Some tourists will play smoothly. Tanjung Benoa is a region that has many water rides to play and have fun with the family. Travelers can enjoy a banana boat, flying fox, a boat, or just play with family laying kite. While at the beach most likely your skin will burn, so the need sunblock to keep skin healthy. After enjoying the atmosphere of the beach in Bali, tourists can try to go to the central Bali. In central Bali there are many natural attractions are very beautiful. In Gianyar, there are many historic temples that have been around since ancient Bali. After that the tourists can go to the mountainous region in Besakih, and Kintamani. There is a lot of interesting places. Lakes and mountains are the leading tourist attraction in Central Bali. Climbing is one of the activities in Kintamani. With a cool and misty air during a given month. After exploring all the attractions and rides in Bali, visit Ubud is the right choice. In Ubud tourists can enjoy the spa that much on offer. Taking the spa after a tired traveled is the appropriate action. Traditional Spa in Ubud will refresh your body. 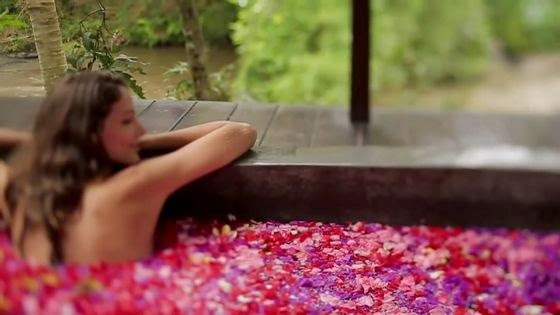 You will be pampered with the scent of flowers, a massage of the hands of Balinese girl, and soak in a tub filled with flowers. When your body massage at the spa, all the dead skin and dirt to be separated from the body. Dead skin that forms since being on the beach when the sun bath, the dirt during a trip to the attractions in Bali, all will be removed when you are in the spa room. Dirt peel off the stick like mud. Not only spa, massage and yoga can be found in Ubud. Very precise you take one of the two activities while in Ubud. Reflexology will rejuvenate your body. Relaxation while doing yoga will restore your mind begins to form while on the road to one of the attractions. With massage and yoga you will be refreshed with a calm mind back.